For too long many disreputable cat food brands have got away with making cheap nasty cat foods which consist of offal and other unsavoury and incredibly unhealthy ingredients, very little thought was put into how cat food was made. The bits that humans didn’t want were fine for peoples pets to eat instead. Thankfully this has changed with consumers becoming savvier and more aware of what they are purchasing. Choosing the best cat food for your cat can have a significant positive impact on your cat’s happiness, health and even how long it lives. Cats have very different dietary needs to humans and dogs. They need high protein (much higher than dogs – which is why you should never feed your cat dog food, or vice versa), low carbohydrate diets. Typically wet cat foods contain less unnecessary fillers than dry cat foods which often rely heavily on grains which are non-essential for a cats diet, however this is not always the case so it is important to do your research so that you are aware that the food you are buying, whether wet cat food or dry cat food, is suitable for your cat. Do let us know what cat food you decide to purchase and what your cat makes of it. Skip to read about the best dry cat foods. ZiwiPeak is a relatively low profile brand at the moment however the New Zealand based cat food company has a growing fan base and it is slowly taking over the U.S, Britain and Europe and definitely deserves a mention as one of the best cat foods currently available. Their growth in popularity is no surprise because of the attention to detail and level of care they take in ensuring that their product is as good as it possibly can be. All of their ingredients are locally and ethically sourced. They avoid using any cheap fillers such as grains and sugars which can often stimulate allergies and contain unnecessary carbohydrates. Nor do they use artificial binders such as TSPP, Xanthan Gum, Guar Gum, Carrageenan and Agar which are all very common in pet foods, instead they use chickpeas as a natural meat binder which is rich in protein and fibre which help your cat digest it. 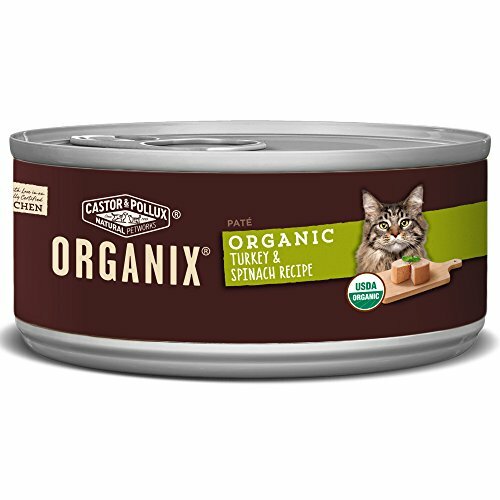 Ideal for Cats that are underweight and need to add bulk and condition. Ideal for Cats recovering from injury or sickness. Ideal for Cats that have allergy issues from grains and carbohydrates. Ideal for Cats that have suffered from digestion issues. Their cat food is made up of 98% fresh meat, organs, bones and seafood. They also add some tripe and New Zealand green-lipped mussels which are great for adding essential glucosamine and chondroitin (these are great for joint health) to your cat’s diet. They also include some parsley to keep your cat’s breath fresh! They pride themselves on ensuring that you don’t find any rubbish in their food. Compare the ingredients below with your average high street pack of wet cat food and you will see a lot of differences. Tests found that ZiwiPeak is so rich in calories that it had up to 60% more calories (per 57gram serving) than some competitors. ZiwiPeak is the food to give your cat if you want them to have the very best. They have a huge range of different tinned flavours available to suit your cat whatever their preferred meat flavour of choice is. These include; Mackerel & Lamb, Venison, Lamb, Rabbit & Lamb, Beef and they are also planning to release a Free Range Chicken product very soon too. Lily’s Kitchen is a London based pet food company which sprang into existence a few years ago when Henrietta’s dog, Lily, got ill. Henrietta decided to help aid Lily’s recovery by cooking for her and this was the beginning of a journey which revealed how poor the quality of so many pet foods is. Consequently Lily’s Kitchen was born as a company which specialises in creating pet food which is full of healthy, natural whole foods without the empty calories and unhealthy additives that are so common. Organic Fish 26%, Organic Pork 12%, Organic Chicken 12%, Organic Beef 10%, Chelated Minerals. Nutritional Additives (per kg): Vitamins: Vitamin D 100 IU. Trace elements (per kg): Zinc Chelate of Amino Acids Hydrate 40mg, Cupric Chelate of Amino Acids Hydrate 2mg, Iodine as Calcium Iodate Anhydrous 2mg, Manganous Chelate of Amino Acids Hydrate 1.6mg. Technological additives (per kg): Carrageenan 0.51mg. Nutritional Information: Crude Protein 9.5%, Crude Oil & Fats 6%, Crude Ash 2.2%, Crude Fibres 0.3%, Moisture 82%, Taurine 723mg/kg. 84kcal/100g. Lily’s Kitchen wet cat food comes in a wide range of flavours including; Cockadoodle Chicken, Scrumptious Chicken & Salmon, Rustic Chicken & Turkey, Hunter’s Chick & Duck, Farmhouse Chicken & Beef, Classic Chicken Dinner, Poultry Pie, Hunter’s Hotpot, Lamb Casserole, Mature Chicken Supper, Organic Fish Dinner, Organic Chicken Dinner, Organic Beef Dinner, Organic Turkey Dinner, Curious Kitten Dinner & Catch Of The Day. As you can see there are a lot of flavours so you are sure to find something your cat likes. These are typically sold as packs of 19 tins with each tin holding 85 grams of food. If you’re looking for organic, ethical, healthy wet cat food which is made in the UK then Lily’s Kitchen is definitely worth a try. Car & Pollux entered the pet food market back in 2003, since then they have grown to become the leading U.S organic pet food brand. Their Organix range is made from chicken or turkey which is always free range. This range of food is free from any chemical pesticides, artificial preservatives, growth hormone, synthetic fertilizers and antibiotics. Basically it is free from all the unnatural and questionable additives that many lower quality pet foods are often full of. Their pet food 100% avoids all genetically modified organism ingredients and even includes prebiotic and probiotic fibres to aid digestion as well as healthy Omega 3 to keep your cat’s skin and fur looking it’s best! The key selling point of their Pristine range is that it is made exclusively of responsibly sourced ingredients. Care is taken to ensure that animals used in the food are raised in a responsible way with access to the outdoors and natural light. Fish used in their cat food comes from wild caught salmon and tuna which have been caught using sustainable fishing practices. All plant matter included in their food are grown without the use of chemical pesticides and synthetic fertilizers which are bad for the environment. It’s not 100% clear from their website what the exact difference between their Organix and Pristine ranges are, however, reading between the lines, we would guess that they are perhaps more fussy about the welfare of the animals used in the Pristine range…if anyone knows better please do let us know in the comments and we will update this. AATU make handcrafted high protein cat food made from 97% fresh meat which is completely free from preservatives, artificial colours and flavours and GM produce. Their food is also free from grain, gluten and white potato so it is perfect for cats that suffer from allergies. 97% CHICKEN AND QUAIL- Our high protein Chicken and Quail cat food pouches are made from 97% meat and 3% of the 'super-8'. 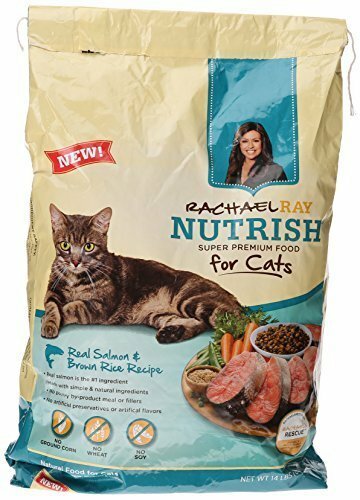 A tasty meal your cat will love! PORTION CONTROLLED, EASY-TEAR POUCHES- Our wet pet food pouches help with portion control and come in easy-tear pouches. Feed as either a complete meal or as a topper with the dry food. All of AATU’s food contains their ‘Super 8’ blend of 8 fruits, 8 vegetables, 8 herbs and 8 botanicals & spices. The fruits are; Orange, Bilberry, Cowberry, Blueberry, Mulberry, Apple, Pear & Cranberry. The vegetables are; Sweet Potato, Chick Peas, Peas, Carrots, Tomatoes, Chicory, Yucca and Tapioca. The herbs are; Parsley, Peppermint, Spirulina, Seaweed, Oregano, Sage, marjoram and Thyme. The botanicals and spices are; Chamomile, Rosehip, Nettle, Marigold, Aniseed, Fenugreek, Cinnamon and Lucerne. As you can imagine there are a lot of health benefits to all of these! 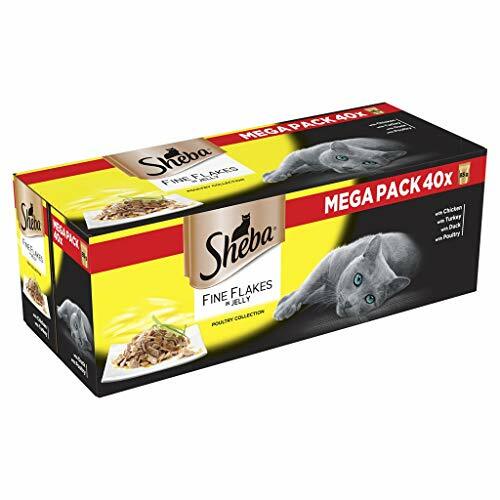 The very low levels of carbohydrate and high levels of lean meat make this a great cat food for any cat which suffers from feline diabetes as minimising their carbs which help control their sugar levels, it is also great for any cat who needs to lose weight as the lack of carbs will quickly see them get back to a healthy weight. 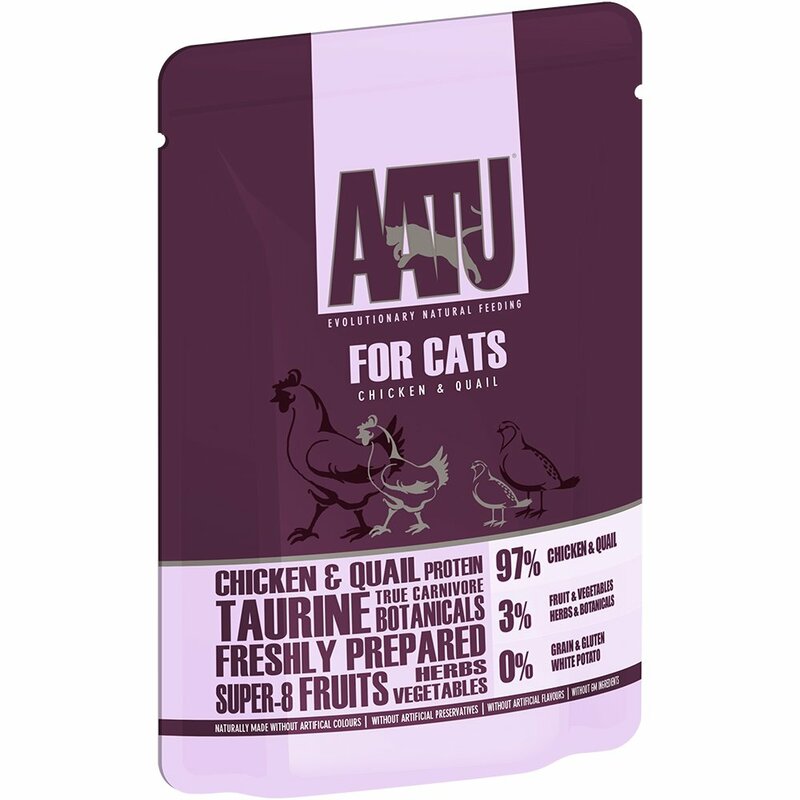 AATU wet cat food comes in 8 delicious flavours including; Chicken & Quail, Turkey & Goose, Chicken & Pheasant, Duck & Chicken Liver, Salmon Chicken & Prawn, Salmon & Herring, Duck, Chicken. IAMS is a brand which will be familiar to most cat owners. It has a large share of the market and dominates pet aisles in many supermarkets up and down the country. Don’t make the mistake of dismissing IAMS cat food as not being top quality because the market is saturated with their products. Their IAMS Naturally product range is a very well balanced wet cat food which cats love. 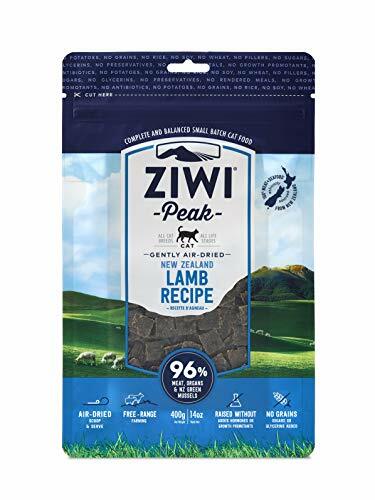 As with ZiwiPeak, IAMS source their meats from New Zealand and mix them with easily digestible ingredients which are packed with key nutrients and micro-nutrients. Their wet foods include blends of fruit and vegetable which add natural fibres to your cat’s diet which further aid digestion. The IAMS Naturally range is rich in omega fatty acids such as arachidonic acid which cats need to get from their diet. This is required for your cat’s inflammatory response which is vital for managing allergies and protecting your cat’s health. It also contains vitamin E which is an essential supplement to help maintain the health of your cat’s skin. 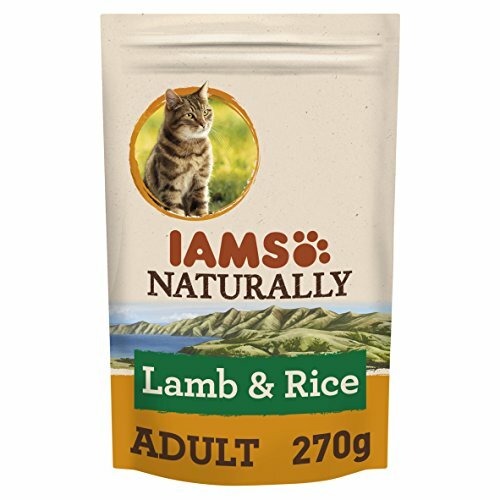 The following flavours of wet food are available from IAMS: New Zealand Lamb in Gravy, North Atlantic Salmon in Gravy, Ocean Cod in Gravy, Wild Tuna in Gravy & Land and Sea Collection in Gravy. 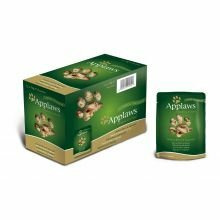 Applaws wet cat food is high in essential amino acids including Arginine and Taurine (which is essential for your cats eyes, digestion, heart function and, if they get pregnant, fetal development). Applaws source their ingredients ethically. For example they don’t include ingredients such as Palm Oil in their cat food. Unfortunately Palm Oil is very common in many pet foods and it leaves a big environmental toll due to the aggressive farming methods used. All of Applaws cat food has a very high percentage of protein in it. For example the Chicken and Asparagus product above has 75% chicken in it and all of their meat used is human grade (that means it is good enough to be fed to us according to food standards agencies). 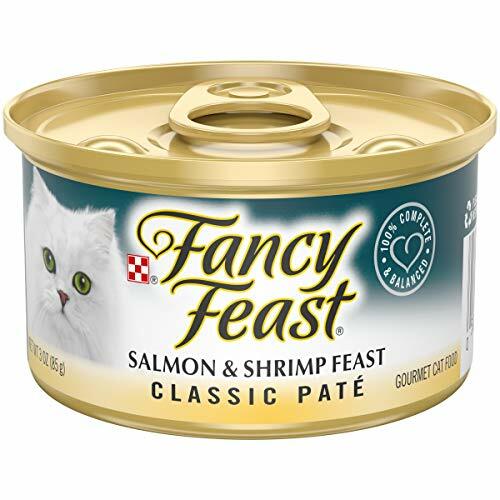 With over 1,400 reviews on Amazon UK (the vast majority of which are positive) Purina Fancy Feast is an extremely popular option which comes at a very reasonable price. Fish broth, salmon, liver, meat by-products, fish, turkey, shrimp, artificial and natural flavors, added color, tricalcium phosphate, guar gum. MINERALS[potassium chloride, magnesium sulfate, zinc sulfate, ferrous sulfate, copper sulfate, manganese sulfate, potassium iodide], salt, Red 3, taurine. VITAMINS[thiamine mononitrate (Vitamin B-1), Vitamin E supplement, niacin (Vitamin B-3), calcium pantothenate (Vitamin B-5), Vitamin A supplement, menadione sodium bisulfite complex (Vitamin K), pyridoxine hydrochloride (Vitamin B-6), riboflavin supplement (Vitamin B-2), Vitamin B-12 supplement, biotin (Vitamin B-7), folic acid (Vitamin B-9), Vitamin D-3 supplement]. As well as the Salmon & Shrimp flavour (the ingredients of which are listed above) there are also 13 other delicious flavour combinations available, these are: Classic Chicken Gourmet, Tender Liver & Chicken Gourmet, Turkey & Giblets Gourmet, Chopped Grill Feast, Tender Beef Gourmet, Tender Beef & Liver Gourmet, Tender beef & Chicken Gourmet, Seafood Gourmet, Whitefish & Tuna Gourmet, Savory Salmon Gourmet, Cod Sole & Shrimp Gourmet, Poultry & Beef and Seafood Feast. Grains are commonly used in cheaper cat foods but these are not a necessary part of your cat’s diet. In fact cats can’t process protein from grains very well at all (dogs are a bit better at digesting plant proteins), feeding your cat food which has a lot of grains in it can contribute towards your cat developing allergies and sicknesses as well as contributing to obesity much more than a grain free food would. There are a number of very good high-quality grain-free cat food suppliers already mentioned on this page including however the one that we felt we had to mention in this section is ‘Wellness’. They have a very large range of different grain-free cat foods available including flavours such as; Chicken Turkey & Chicken Liver, White fish Salmon & Herring, Chicken & Turkey specially for kittens, Beef Venison & Lamb, Indoor Chicken & Chicken Liver, Turkey & Duck, Beef & Chicken, Chicken, Chicken & Salmon and Turkey. 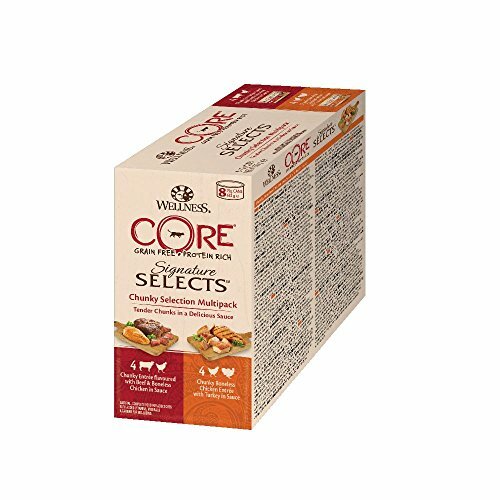 They have a couple of different wet food options available these are their CORE Pate and CORE 95% ranges. The CORE Pate cat food is, obviously, a Pate (seen in the GIF below from their website). This is a grain free protein rich blend which has plenty of water in it too to help with digestion and urinary health. The CORE 95% range is made up of 95% meat and comes in four different mixes which are Beef & Chicken, Chicken, Chicken & Salmon or Turkey. Beef, Chicken, Water Sufficient For Processing, Cassia Gum, Xanthan Gum, Ground Flaxseed, Potassium Chloride, Choline Chloride, Taurine, Salt, Iron Proteinate, Zinc Proteinate, Thiamine Mononitrate, Vitamin E Supplement, Copper Proteinate, Manganese Proteinate, Sodium Selenite, Niacin, d-Calcium Pantothenate, Pyridoxine Hydrochloride, Riboflavin Supplement, Vitamin A Supplement, Biotin, Potassium Iodide, Vitamin D3 Supplement, Vitamin B12 Supplement, Folic Acid. Having a cat that suffers from allergies can make it hard to know what cat food you should be buying for your cat. There are a few key ingredients that are known to cause allergies in cats, these are; artificial colouring, corn, dairy, meat by-products, preservatives and seafood. Avoiding all of this can seem like an impossible task as mainstream cat foods often contain at least one of them. Fortunately, there are a good selection of hypoallergenic cat foods now available if you know where to find them. Our personal favourite is Purina Pro Plan Hypoallergenic Dry Cat Food. It has been scientifically engineered to minimise the chances of an allergic reaction being caused. A complete hypoallergenic veterinary diet for the diagnosis and management of food allergies in cats of all ages, including kittens. The protein that they used has been hydrolysed which means that the protein particles become too small to cause allergies, I’ve no idea how this works however I do know that hydrolysed food is recognised as being the best type of food to use during an ‘elimination diet’ (where you give them different foods to see which causes an allergic reaction) as there is minimal chance of it causing any reaction. They also purify all carbohydrates used in their food to again reduce the possibility of any contaminants which may cause allergies ending up in your cat’s food. It is impossible for us to objectively say exactly which wet cat food is the very healthiest of them all because the best option for one cat may not meet the dietary needs of another cat. If your cat has any health problems or is highly active or inactive then their dietary needs will vary. Having said all that chances are that if you choose one of the three we have highlighted below then your cats diet will be very close to as good as it gets. However do please consult your vet on what the optimal diet for your cat should look like, particularly if your cat suffers from a disease or illness relating to diet such as feline diabetes. 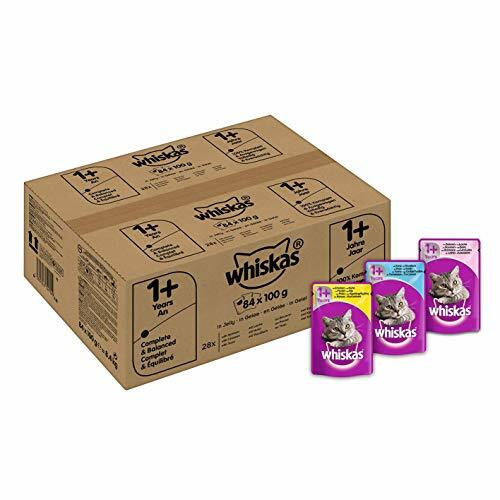 Most of the wet cat food we have mentioned here is tinned however there is nothing wrong with buying wet cat food in pouches and there is generally no difference in quality or moisture content at all. The benefits of using a pouch as opposed to a tin are that it is very easy to rip of the top of a pouch and let the food slide into your cat’s bowl, no need for a tin opener at all! As with all cat foods though ensure that you carefully check the protein, carbohydrate and grain content of any pouched cat food that you buy. Dry cat food can often contain 50% carbohydrates in the form of grain. This isn’t great for your cat as their natural diet would not include much, or even any, grains at all. A natural cat diet would be made up of at least 70% protein. The very best dry cat foods will have low carbohydrate content and high protein content. They will be made up of all natural ingredients without tons of nasty and unnecessary fillers which have no nutritional or health benefits, these are often only added to bind the food together. Suitable For Weight Loss & Diabetic Cats? Purina’s Beyond Natural range of pet foods has been carefully developed by leading pet nutritionists so that you can be confident that your pet is getting an adequate and well-balanced diet. As with most of our favourite brands they make sure that their food is made from only the cleanest most thoughtfully sourced ingredients. They say that ‘Beyond isn’t just their name, it’s their philosophy’, the implication being that they aim to go beyond what you expect of your cat food. All of their USA made food includes a traceability guarantee which means that you can easily find out exactly where all their ingredients is sourced from. 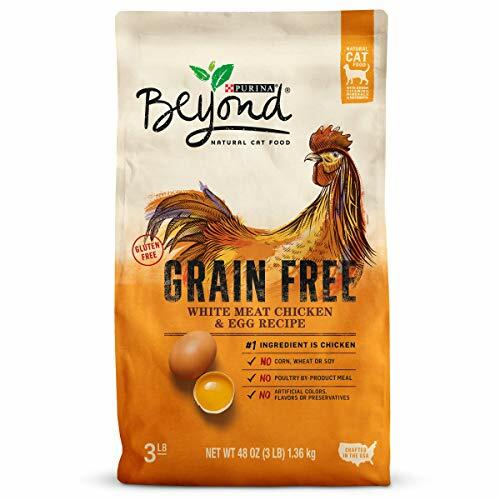 The Purina Beyond Natural product below their chicken recipe is and contains white meat chicken and egg recipe which is naturally combined without using any chicken by-products, grains, gluten or soy. Rachael Ray is a popular TV chef in America and has hosted her 30-minute meals show on the Food Network for 11 years! She has also appeared on shows such as the Oprah Winfrey show and has written almost 30 books on healthy eating. There’s no denying that she knows her stuff when it comes to creating healthy meals for humans and she has proved with her Nutrish Natural Cat Food that she can turn her hand to cat food just as well. Nutrish pride themselves on ensuring that all ingredients used in their food are clean, high quality and highly nutritious food with a minimum of 30% protein. Salmon, Ground Rice, Corn Gluten Meal, Fish Meal, Brown Rice, Poultry Fat (Preserved with Mixed Tocopherols), Brewer’s Dried Yeast, Dried Ground Peas, Pea Protein, Natural Flavor, Salmon Meal, Dried Plain Beet Pulp, Calcium Carbonate, Choline Chloride, Iron Oxide (color), Dried Carrots, Olive Oil, Taurine, Salt, Vitamin E Supplement, Zinc Sulfate, Ferrous Sulfate, Niacin, L-Ascorbyl-2-Polyphosphate (Source of Vitamin C), Manganese Sulfate, Copper Sulfate, Vitamin A Supplement, Thiamine Mononitrate, d-Calcium Pantothenate, Sodium Selenite, Riboflavin Supplement, Pyridoxine Hydrochloride (Source of Vitamin B6), Biotin, Menadione Sodium Bisulfite Complex (Source of Vitamin K Activity), Vitamin B12 Supplement, Folic Acid, Vitamin D3 Supplement, Cobalt Sulfate, Potassium Iodide. Nutrish includes grains in a lot of their cat food but they also have a grain free range as well if you are aware that grains are problematic for your cat, the grain free range does appear to be difficult to get hold of in the UK though if this wasn’t the case we may have ranked Nutrish higher in our list of the best dry cat food! For those of you who like to shop ethically it is worth mentioning that a small percentage of all sales of Nutrish go towards the Rachael Ray Foundation which supports animals in need. Hills Science care about cats and the food we feed them. They take great care to ensure every ingredient put into their cat food serves a purpose, ingredients aren’t just added for the sake of bulking the food out the yare added because they have proven nutritional and health benefits. The Ideal Balance product showcased below is a Tuna & Potato grain free mix. 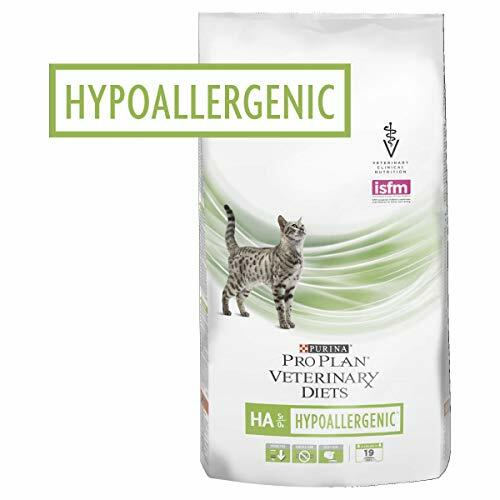 This is a hypoallergenic cat food which means it is also suitable for any cats that may suffer from allergies as it contains no ingredients which are known to trigger allergic reactions. Hills Science contains a lot more protein that you typically find in most dry foods. Typically dry cat food will contain up to 40% at best, whereas Hills is made up of 70% lean protein! It is based on a potato mix which is gluten-free so should not cause any digestion problems. 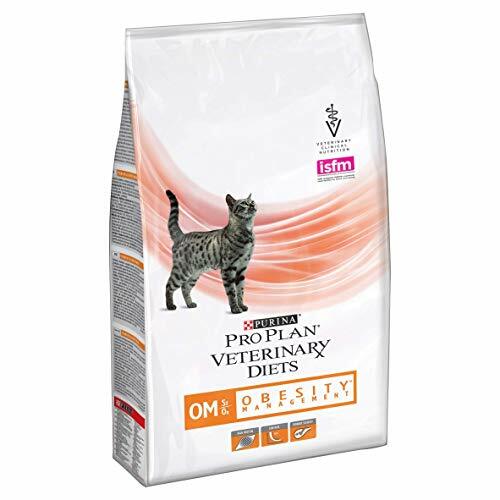 It also contains a mix of carrots, peas and tomatoes which add healthy vitamins, minerals and antioxidants to your cat’s diet along with the added Flaxseed which is a great source of Omega 3 & 6 which is an essential part of any cats diet as it helps maintain great skin and coat health. Tuna meal (17%), pea protein, potato starch, dried potato (15%), animal fat, yellow peas (4.9%), dried peas (4.9%), soybean oil, digest, fish oil, minerals, dried beet pulp, flaxseed (1%), dried carrots (0.5%), dried tomato pomace (0.2%), spinach powder, dried grape pomace, dried citrus pulp, vitamins, trace elements and beta-carotene. With a natural antioxidant (mixed tocopherols). Low calorie diet to help with weight loss. Urinary security: helps minimise struvite and oxalate urinary stones formation which are more common in overweight cats. High levels of natural fibre and protein to help your cat feel full and satisfied. Once ideal weight is reached, your cat can continue to be fed PPVD OM to help maintain their ideal weight. 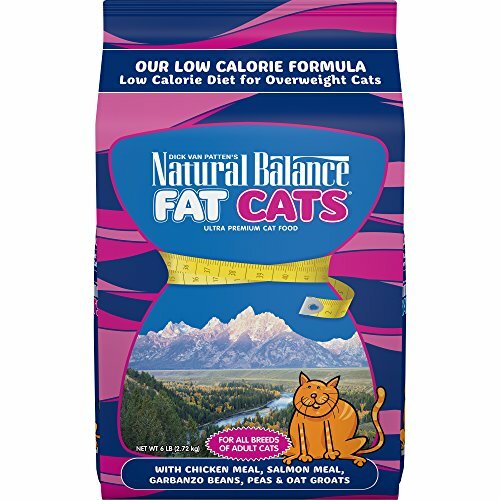 Natural Balance Fat cats, is (as you can no doubt tell from the name) designed for overweight cats who need to lose weight. Cats which have high carbohydrate diets are prone to putting on excess weight, cats don’t need a huge amount of carbohydrate as they can get almost everything they need from meat. 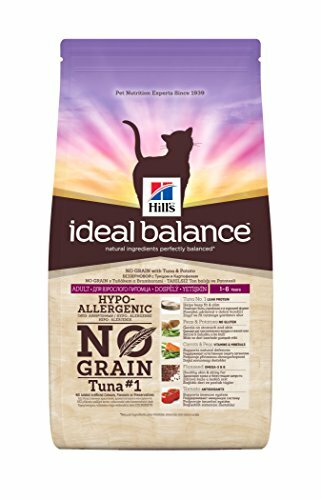 A quick scan of the internet reveals that reviews for this product are very positive with stories of cats losing 25%+ of their body weight simply by switching their usual food to Natural Balance Fat Cats. Although there are fewer calories in it than most cat foods great care has been taken to ensure that it is completely nutritionally balanced so that your cat still gets everything they need to be healthy and fully functional. It is also made with plenty of added natural fibre to aid your cat’s digestion, this also helps to keep your cat feeling full so that greedy cats won’t be coming looking for food quite as quickly as they otherwise would be on a different cat food brand. *based on using a standard 225g measuring cup. The amount of food you should be feeding your cat depends on how big and how active your cat it, their age and if they are pregnant or are feeding young kittens. Most cats require about 60 calories of food per kilogram of body weight. The average cat weighs around 4 kilograms so will require 240 calories of food per day. This is close to the number of calories that a 160 gram tin of wet cat food contains so you can simply split the can in half and give them half in the morning and half in the evening. If your cat is pregnant, nursing or is significantly more muscular than most other cats then add an extra quarter can of wet food or mix in a small scoop of dry food. For more information on how much to feed your cat read our guide here. If your cat is used to eating dry food and you suddenly introduce them to wet food they may not take too well to it. Cats are very sensitive to changes in flavour and texture and can be hesitant to try something new and unfamiliar. An easy way to introduce your cat to wet food is to mix a small amount of wet food in with their dry food. Start with around 15% of their meal being made up of wet food and ensure that it is thoroughly mixed in with their dry food so that they can begin to get used to the flavour and texture without it being overpowering and off-putting. Slowly increase the ratio of wet food to dry food by roughly 5% each day, hopefully your cat will quickly get used to eating wet food and will soon be enjoying a diet of exclusively wet food. Related article: How Long Can Cats Go Without Food? The main benefit of dry cat food is that it is usually cheaper than wet cat food and it is far more convenient to store. Good quality wet cat food is better for your cat than dry cat food because it is usually far more protein rich. Cat’s dietary requirements are very different from dogs. Dogs can happily process both vegetable and animal-based proteins however cats can only make use of animal proteins so wet food is better for them as most wet foods are made from protein-rich meat and fish. It is not true that wet food is always better than dry food for your cat. Cheap wet food can contain a lot of empty fillers with very little nutritional value whereas premium dry foods can be just as protein-rich as some wet cat foods. When choosing food for your cat it is always a good idea to spend a bit extra so that you can be certain that your cat is getting the high-quality animal proteins that they require. Most cat foods are made up of somewhere between 20% – 70% carbohydrates. 70% Carbohydrate sounds like a lot, particularly when you consider that cats natural diets consist of only around 5% carbohydrate which comes from the contents of their prey’s stomach. It is a commonly held belief that the best cat foods must use as few carbohydrates as possible. Cats have the ability to turn protein into energy and muscle, although carbohydrates can be turned into energy much more quickly than protein (find out more about cats and carbohydrates in this insightful article here). So in order to prevent over inflating cat food prices while still providing your cat with everything they need most cat foods will use carbohydrates to meet your cat’s energy requirements and your cat’s protein requirements will be met with meat. Cheap, low-quality cat foods will usually have a high ratio of carbs to protein, whereas higher quality products have a high ratio of protein to carbs. However don’t be afraid of carbohydrates most cat foods will contain them and they aren’t bad for your cat so long as they are over consumed. A benefit of using carbohydrates in cat food is that the plant starch in it helps to add structure and texture to the food, plant starch (found in grains such as wheat, corn, oats and rice) is also very easy for cats to digest and turn into energy. It is important to note that cats have much higher protein and fat requirements than dogs so don’t make the mistake of feeding your cat dog food as they will end up malnourished! The big problem with carbohydrates is that over-consumption can very quickly lead to health problems for your cat. Being overweight means your cat may develop joint problems, feline diabetes and more. Over-consumption of carbohydrates can also cause digestion problems such as excessive gas (read our article on ‘do cats fart?‘ for more information on feline flatulence), a bloated stomach and even diarrhoea. Carbohydrates are not a problem in a cats diet so long as care is taken to ensure that your cat is eating an appropriate amount of food. When looking for the best cat food for your cat look for high protein cat food, the higher the better, (but don’t worry about the carbs, they are inevitable and won’t cause a problem for your cat) that are made from high-quality ingredients. I disagree, most of the cat food listed here is not organic with the exception of Lilly’s Kitchen and Purina Pro Plan. 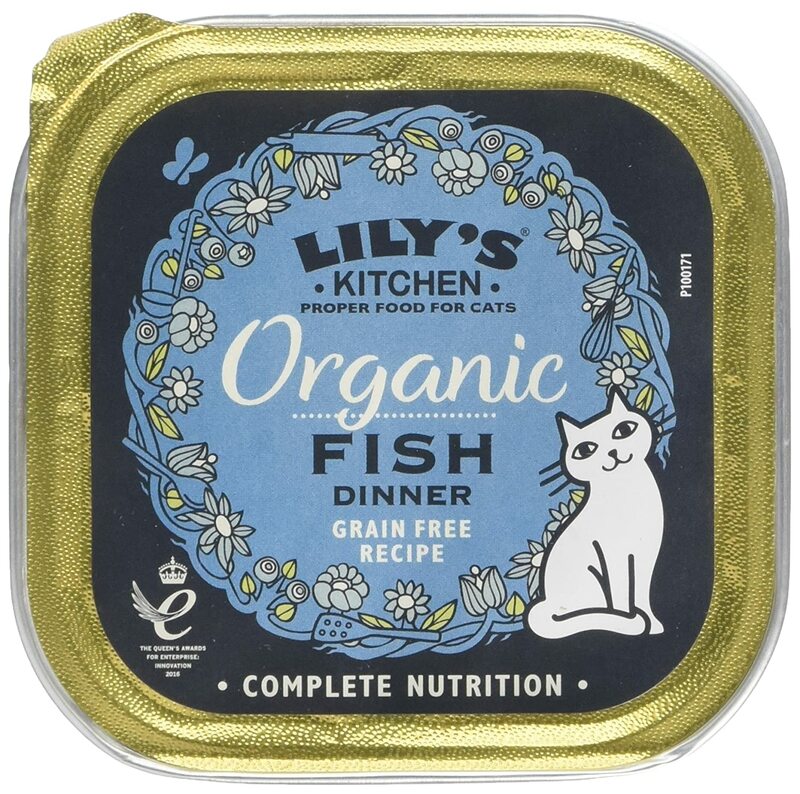 Personally we don’t feed our cat organic food however if someone is looking for great organic cat food then we recommend Lilly’s Kitchen. If you don’t like the idea of organic cat food there are plenty of other great non-organic choices on our page! How does it compare to the other brands and options listed here? We have a 6 month old Mainecoon kitten and a 12 month old DSH bombay cat. The MC kitten is always hungry and occasionally has a smelly mouth, gums look ok so far and vet checks not returned anything with his teeth. He’s been on fresh boiled chicken for two months since he came with Giardia from the breeder! which thankfully has now cleared up we think as his stool is back to normal. The DSH eats Almo Nature Legend at present. Both are fed Royal Canin MC biscuits as dry food which they love. Would be great to have them both on the same good wet diet ..as the MC seems to be allergic to something in Almo. We think it gives him an upset tummy – it could have been the Giardia but he use to get worse on Almo- wasn’t able to keep it down at all. Both are indoor cats with access to a small patio. thanks in advance. Does anyone know if it’s a good idea or if anyone already blends the wet and dry food together in a blender? Does it break the blender and does your cat then eat the food? I’ve never blended wet and dry cat food together however i have mixed it in our cat’s bowl and she enjoys it and happily eats it. I’ve put much tougher stuff than cat food in our blender in the past and it has never caused the blender any damage so I’m sure you won’t have any problems blending it. Blended food is ideal for cats who have lost a lot of teeth that may struggle with chewing the dry food, if you cat still has their teeth then you can just mix the food in their bowl as i did.